Bushiroad reveals a Cray Elemental of the August set, one that reacts to the Deck being shuffled. AUTO (RC): When your opponent’s Deck is shuffled by your opponent’s card effect, during that turn, this Unit gains Power+5000 and “CONT (RC/GC): Resist”. 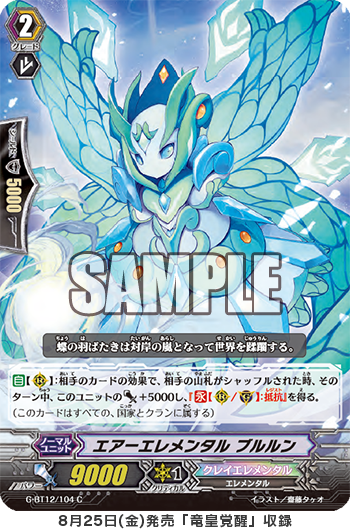 • The 《Cray Elemental》 “Air Elemental, Bururun”, from the 12th Booster Pack “Dragon King’s Awakening”. The “Pacifica” SP Clan Pack, contains past “Pacifica”! The Pacifica needed to activated the effect of “Fantastic Passion☆, Pacifica” are in this pack! So, if you get the chance, make a “Pacifica” Deck! And, starting today, we’re also introducig cards from the 12th Booster Pack, “Dragon King’s Awakening”! The 《Cray Elemental》, “Air Elemental, Bururun”, when your opponent’s Deck is shuffled by an opponent’s card effect, it gains 5000 Power and “Resist”. By activating this effect, its Power becomes 14000 on its own and “Resist”, making it a hard to beat Rear-guard. Since many opponents are likely to use Clans that Call cards from the Deck, this card can be used against many Decks. And during your own turn, if your opponent uses G Guardians that shuffle their Deck like “Highbrow Steam, Raphanna” or “Little Great Sage, Marron”, it still gains Power, meaning it can effectively be used in an offensive or defensive manner. From here on, for “Today’s Card”, we’re gonna introduce cards “Prismatic Divas” and “Dragon King’s Awakening”! Please enjoy!